Explore our Morocco surf holiday destinations. They say the first people to surf Morocco where the US military in the 1950's, from a US Air Facility in Mehdiya, close to Rabat, in northern Morocco. A group of French who worked at the base took to it and subsequently had boards made in a boat factory in Casablanca. A small group of surfers developed made up of a handful of French, Italian and Moroccans and they started making the journey up and down the coast searching for waves. In the late 1960's & early 70's southern towns like Essaouira & Taghazout became a hippy paradises thanks to their lax laws, easy going way of life and year round sunshine. The likes of Jimi Hendrix and the Rolling Stones regularly passed through. What became clear to people was that the area was full of world class surfable waves! Word about the surf in Taghazout & Southern Morocco soon reached travelling surfers and in the 70's and 80's it became a popular destination for Aussies and Americans. The norm was to spend the winter months travelling up and down the coastline in vans or beat up cars, surfing all day long. There was little in the form of hotels or Morocco surf camps or direct flights so it was a bit of a mission, but those who made it were heavily rewarded. It took a long time for locals to embrace the surf. In the late 80's Morocco's first national surfing competition took place and from there it started to grow. In the late 90's King Mohamed VI built a big surf club in Rabat offering free surf equipment and urged locals to follow his passion for surfing. Since then the government tourism department has actively encouraged surfing in Morocco and it has become a big economic driver in some small towns along the south west coast such as Taghazout and Tamraght. Morocco now hosts a World Surf League event every September, the Quiksilver Pro Casablanca at Anfaplace. Local surfers Ramzi Boukhiam and Jérôme Sahyoun are joining the world's elite and proving that Moroccan surfers are among the best in the world. What's the surf like in Morocco? If you have already surfed in mainland Europe, then your next trip should be a surfing holiday in Morocco. It's a truly unique experience. Like its European counterparts the coastal areas offer spectacular long white sandy beaches and endless surf options but it is Morocco's mix of culture, geographical location, old world history and the people that make it really stand out as a fascinating surf destination. Morocco's geographical location on the Atlantic Ocean, stretching from the European style cities up north down into the nomadic Sahara desert regions down south give it a diverse cultural richness like no other. While it is a year round destination, it is best visited between Autumn and Spring time. Stay in one of our surf camp Morocco options and you will spend the day surfing beautiful white beaches, and the afternoons sipping mint tea in the sunshine meeting and hanging out with the countries unique blend of Berber, Arab & African population and of course the surfing population that have been drawn towards this intriguing part of the world. Yoga is also highly popular in the region and available at most of the surf camps Morocco options on our site. Although a year round destination it is generally more consistent from May to October. Rabat is the best place to start as the beaches further north up to Tangier are unprotected beach breaks and don't hold as much swell. Medihya beach is known as the birthplace of Moroccan surf and is a very reliable righthander. The area around Rabat has at least 8 spots of different standards including the famous Doura, a long fast barreling wave. Rabat is one of the greenest parts of Morocco, the old town is very peaceful & laid back, and often compared with towns in the Greek islands with its blue and white paint decorating the buildings. Casablanca on the other hand is noisy and busy. Its Morocco's biggest city with 4 million people and can be hot and sitcky so best to get to the beach quick. There are plenty of surf beaches in Casablanca, south of the city is Ain Diab, which hosts a lot of competitions. North of Casablanca is the famous Les Sablettes, a great beginners surf area with a good surf vibe. Central Morocco surf is famous for its vast amount of classic right hand point breaks. Starting from Safi down to Agadir the area has the best surf in Morocco. Surfing holidays in Morocco tend to centre around the towns Taghazout & Tamraght. They are the mecca of Morocco surf and home to a great mix of Morocco surf resorts and Morocco surf camps. The variety of waves in the area is quite staggering. Taghazout grew as a surf holiday destination largely due to the world class Anchor Point right hand reef and the surrounding waves of Killers, Boilers & La Source. The breaks perfectly suit intermediates looking to progress. Further south you have a great selection of beginners learn to surf spots that continue down to the town of Tamraght which is only 5 minutes away. Taghazout is an easy 30 minute drive from Agadir. The area has the biggest variety of surf camp Morocco options in the country. Further north is Essaouira, a charming town with strong French influence (often compared to Brittany). Famous for being a hippy town in the 1960's, it has now become a surf haven and is a great beginner & intermediate spot. There are surf breaks all up and down the coast here, often uncrowded. Safi is the next big town north, one of the oldest cities in morocco, and a main fishing port for Sardines. The government has designated the surf spots around Safi as an official protected surfing park. It has a great mix of beginners and intermediate spots and some more advanced but fickle righthand point breaks. 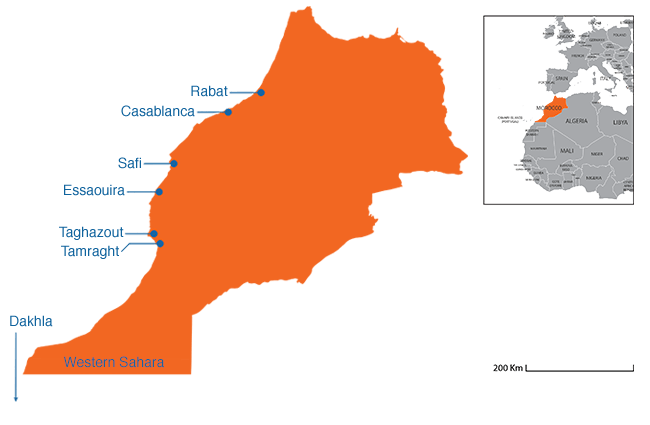 From Agadir down to the Western Sahara town of Dakhla is over 1,400km of coastline. If you want a real surf Maroc adventure, off the beaten track with empty waves then this is it. Your surfing will be restricted by the roads that lead to the various towns by the sea. The area can suffer from strong winds from April to September and of course the heat as you get closer to the Sahara. Furthest south is Dakhla, which is becoming a major water sports area with a nice laid back vibe and great mix of reefs and beaches for surfing, kite-surfing and windsufing. All this makes it a unique destination for surf holidays Morocco. Morrocco surf in the north of the country has water temperatures of 22°C water in the summer, dropping to 16°C in Winter. July & August can be surfed without wetsuits and in the winter a light wetsuit or shortie. Air temperature averages around 30°C in the summer with a nice Ocean breeze to keep the full strength of the sun away. In winter it averages 20°C and gets cooler at night. In the central coastal area of Morocco the temperature is one or two degrees higher. The warm water & air temperature make it an ideal surfing holidays Morocco winter getaway. All that is needed is a light wetsuits in winter and shorts/shortie in summer. 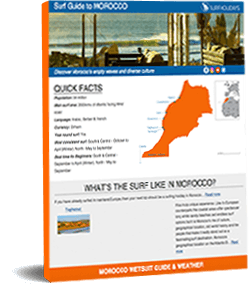 For a more detailed look at when & where to surf in Morocco for your surf level use our Surf Trip Finder. Then browse each destination to discover the best selection & lowest prices. Book your surf holiday online now!